Pioneers is all about learning, innovating, and trying new things! And we’re here to support you every step of the way. On this page you’ll find information about becoming a mentor, some handy resources, and ways to contact us if you have any issues. You need to be 18 or older, and live in the UK or Republic of Ireland. You need to have enough time to mentor your team for the duration of the entire project, whether that be at a single making event or over several sessions. If you want to host your team’s meet-ups in a venue or at an organisation which has safeguarding guidelines, you must follow those guidelines. Feel free to contact us with any questions or concerns. Helping your team create something awesome by giving them support, and by guiding them if they encounter obstacles. Acting as your team’s main point of contact with the Pioneers staff. Sharing what your team is doing online with the hashtag #MakeYourIdeas. Making sure your team stays safe online by following our online safety guidelines. We’ve put together a few handy documents to help you on your Pioneers journey. Mentor Guide: Some tips and tricks on making your Pioneers experience smooth sailing. Online safety guidelines: Some information about staying safe online. 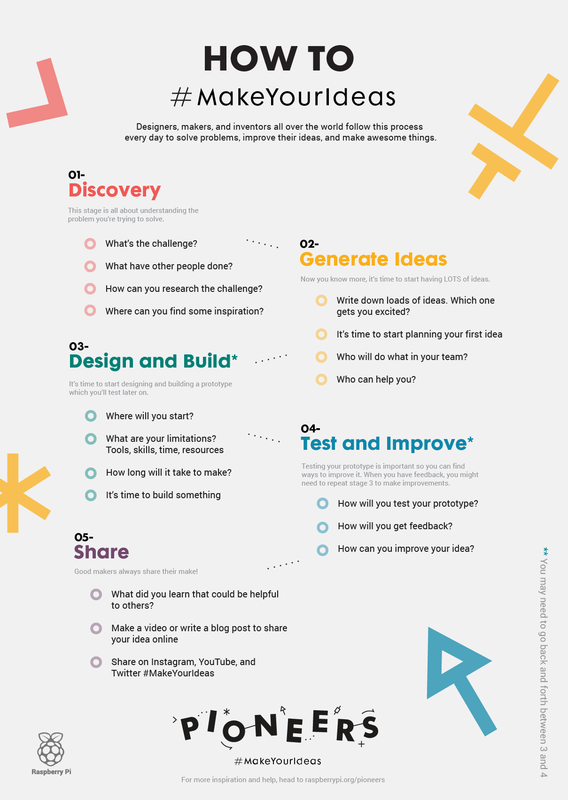 How to #MakeYourIdeas: A diagram outlining the Design Process followed by inventors and makers the world over! What is a Pioneers event? The full lowdown on what a Pioneers event looks like, including tips and guidelines on hosting one at your school, club, or makerspace! Stay tuned for our upcoming worksheets and other useful documents. Slack is an awesome instant messaging tool that helps teams collaborate. By joining our Pioneers channel, you’ll get access to all sorts of useful tips and tricks from your fellow mentors, as well as from the staff at Pioneers! Check the ‘Joining the community’ section of the mentor guide for details on getting started. Every season of Pioneers, we hold fortnightly video hangouts for our mentors. They are your chance to connect with other mentors, hear about their makes, and ask the Pioneers staff all your questions. Our next four video hangouts will be at 17.00 GMT on Thursdays 21 Sept and 5 Oct, and Tuesdays 26 Sept and 10 Oct.
We also have a Pioneers section on the Raspberry Pi forums. Head over there to chat to the always enthusiastic Raspberry Pi community about all things Pioneers. Check out our FAQs page for answers to our most commonly asked questions.